We are producing real Horn Necklace which are manufactured from natural cow and buffalo horns. Its handmade. We can also customize as per the client's requirement. It is made up of buffalo horn and fully made by hand. If the quantity is high i will decrease price. These are made artistically from bone and horn and compasses contemporary as well as traditional designs. Bone and Horn Necklace are most sought after product among youths and hence are trendier in look. These signature pieces also enhance the personal style of the wearer. Buffalo horn heart shape pedant necklace come with leather adjustable chain to fit neck..
An exclusive range of horn necklace. Eye catching and unique, our horn necklaces are available in various designs that are carved by our skilled craftsmen. Offered in different shapes and sizes, these necklaces have horn beads woven into durable thread. 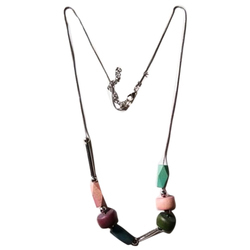 The mesmerizing color combinations of our necklaces make them go with any kind of apparels. Engaged in manufacturing of Horn Necklace.